We get to describe the shores of Elliston as “familiar”! Though we had many adventures in Newfoundland this September, the main reason we came back was for a big-hearted festival in the town of Elliston. We learned about Roots, Rants, and Roars while we were on our historic root cellar tour last year, and it immediately topped our ‘festivals-to-go-to list.’ We’d been so charmed by the community of Elliston during our road trip, it felt unreal to be back on those familiar shores less than a year later. The Roots, Rants, and Roars Festival is a celebration of the bounty of land and sea. 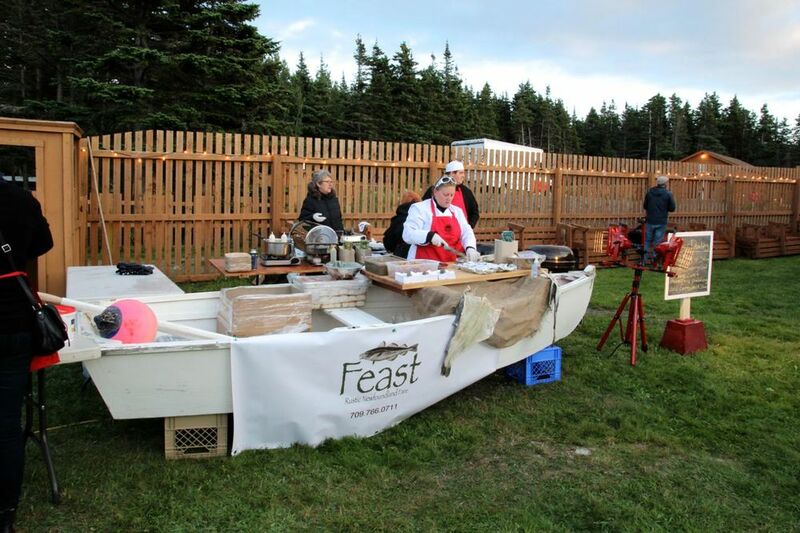 All three of the signature events—Cod Wars, the Food Hike, and the Feast—demonstrate the inherent badass-ery of Newfoundlanders, particularly because they all take place outside, in a windy coastal town, and in Autumn. In other words, wear ALL of your layers, and do not forget a toque. The first official event was Cod Wars, during which seven Newfoundland chefs (many of whom participated in the From This Rock Dinners we went to last year!) served dishes that featured cod, the iconic Newfoundland ingredient. 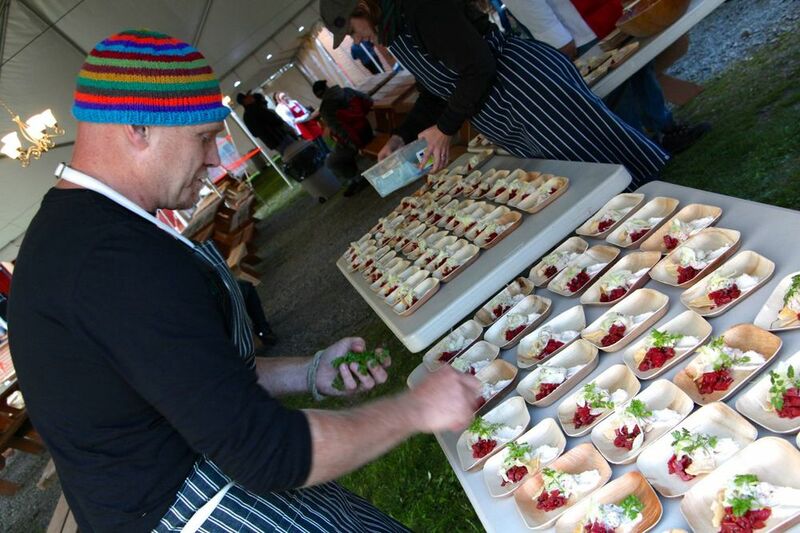 Festival-goers sampled all seven dishes while sipping Qidi Vidi beer and wines selected by Dialogue Wines in St. John’s, only taking breaks from cod for hand-rolled truffles from the Newfoundland Chocolate Company or mussels prepared by Chef Adam Blanchard of Five Brothers Cheese. Chef Roary’s warmly-spiced cod pakora was served with partridgeberry chutney and raita. It was a fun alternative to fried fish, and so, so warming during the chilly evening. Prior to the event, we stumbled upon Chef Murray on the beach as he foraged for juniper along the coastline. His wonderful cod was barbequed over juniper-smoked coals, and served with salt cod, sautéed chard leaves and chard rib chutney. 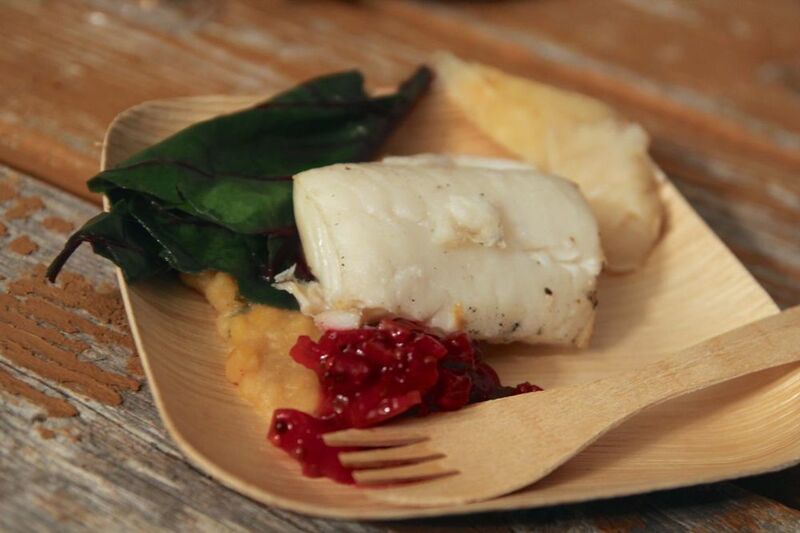 As a festival founder and one of Newfoundland’s most beloved chefs, Chef Todd’s cod-heavy dish did not disappoint. 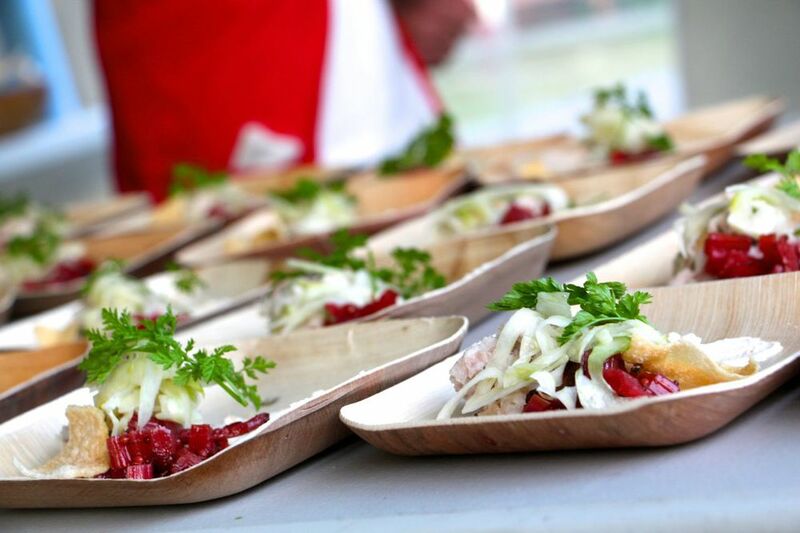 He served pickled cod cheeks with smoked cod belly, cod roe yogurt on a cod cracker, fennel slaw, and chard rib relish, all topped with fish skin salt. This was our second encounter with chard ribs this evening, and I’m officially inspired to start experimenting with ruby red chard stalks. After a spectacular meal at the Doctor’s House Inn just a few nights before, we knew Chef Chris would deliver. Heck, we’d have been happy to eat his cod caprese salad all over again. He prepared something entirely different, however: fried cod with sweet corn and bacon veloute, served with organic chili, and a pepper fritter that was so good we wished we’d eaten ten. Chef Roger made savoury cod sausages served in a brioche slice with corn and mascarpone pudding, salsa verde, and buttermilk coleslaw. It was served alongside some root vegetable chips and capelin tapenade. It was a playful take on a festival classic—the hot dog! This was a unique combination of flavours. 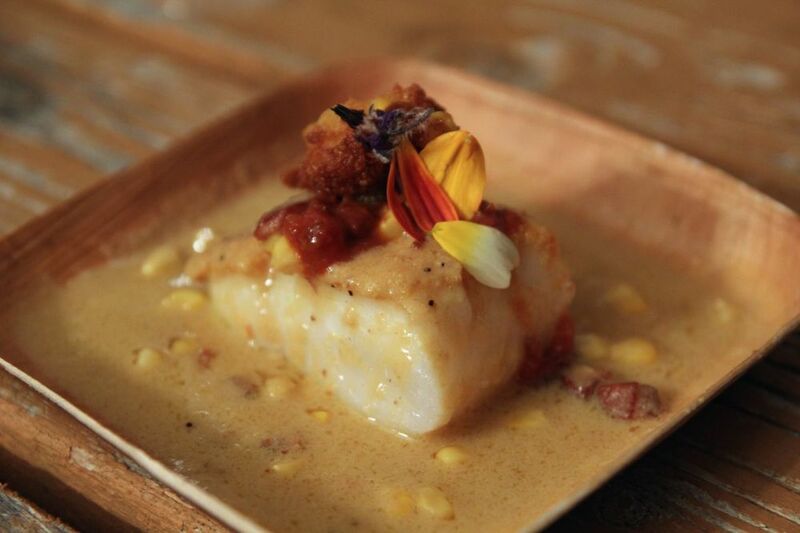 Chef Roger combined cod with peaches and cream corn, bacon, and a peach salad. It was a refreshing dish, with the sweet peaches pairing surprisingly well with the cod. Chef Kyle served cod tightly wrapped in savoy cabbage alongside cured pork cheeks, chickpea puree, root vegetables, and a honey mustard apple and pickle relish. The dish was a nod to a classic Jigg’s dinner. It’s a testament to the skill of these chefs that we were able to try seven cod dishes in one evening and not get sick of cod. It was SO hard to choose between the distinct dishes, as each showed so much creativity and local pride. Through their votes, however, the crowd spoke, and Chris Chafe of the Doctor’s House was named King of Cod. Congrats to Chef Chris, and to all the other chefs who masterfully flexed their cod-preparing muscles that night. Jim Payne, Craig Young, and Sherman Downey were the evening’s musical guests, and once dinner was over, the cod-stuffed crowd took to the dance floor. More to come from the festival, including a “grueling” food hike, and the final feast! 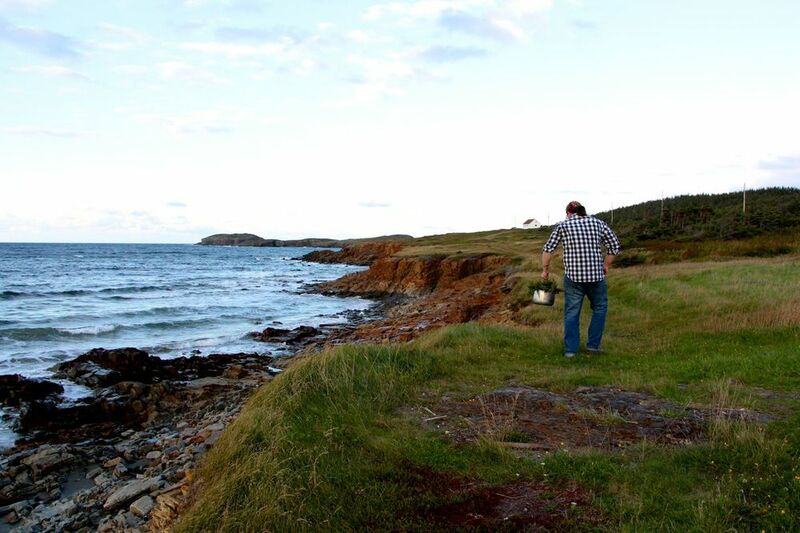 Here's a little tune by Sherman Downey to virtually transport you to Elliston..